Are you familiar with this toy? 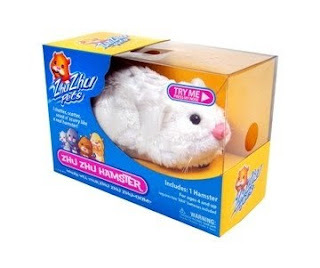 It is a little hampster who has three other little friends called Zhu Zhu pets. They have all sorts of things you can get for 'em, like sleeping bags, hampster wheels and more. I don't think they poop. Anyway, I talked to Kyla about this Zhu phenomenon, and she had plenty to tell me about them... and I guess they're gonna be the MUST HAVE present for Christmas this year!! !